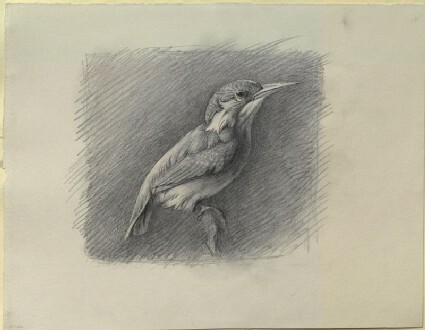 R|202} Study of Kingfisher, with dominant reference to shade, but local colour still kept note of, as an element of shade. M.
R. 202. Pencil on white paper reinforced with black.Study of Halcyon. To be drawn with BB pencil, on standard white, and touched with common ink, nothing else. The object of this study is to enable you to use a BB pencil as if it were black paint; gradating with it rapidly. The use of the ink is to define essential lines which the dusty pencil is apt to lose; and to secure blacks that do not shine.